We returned this week to the Leonard and Bina Ellen Gallery to revisit the exhibition Material Traces: Time and The Gesture in Contemporary Art, curated by Amelia Jones and encompassing a range of works by both local and international artists. It was at the opening of this show that we first encountered photographs documenting Heather Cassils’ Becoming an Image, the live performance which we wrote about in a previous post. Cassils’ photographs, like each of the works included in Material Traces, foreground the performative process of artistic production, attesting to the fact that all works of art – like all objects and experiences – exist and evolve in time. Manufactured and mobilized by the labouring body of the artist and receptive body of the spectator, an artwork’s life is never linear. It exists in a perpetual state of temporal flux, referring both back to its own and older origins and ahead toward the future attention of subsequent spectators. Comprising plastic, plywood, paper, paint, photography, video, performance, and installation, each of the works included in the show afford a different angle from which to address and examine notions of materiality and time in contemporary art. While some of these works are more obvious in their status as objects, others are produced in media more often associated with ephemerality or immateriality. Video, for example, is utilized in a number of works and takes the form of tangible trace, asserting, as Jones writes in the exhibition catalogue, “the ‘having been made’ of the work of art” (“Material Traces: Process, Matter, and Interrelationality in Contemporary Art,” 11). Alex Monteith’s wall-sized double video projection – concisely titled Passing Manoeuvre with Two Motorcycles and 584 Vehicles for Two-Channel Video Installation (2008) – displays video footage recorded by two cameras mounted on motorcycles as they careen down an Auckland highway and adeptly weave between lanes of traffic. One camera attached to the back of a bike films the approach of another following behind, which in turn films the back of the first. In this way, the cameras and their recorded views form a closed loop of mutual documentation that renders concurrent the temporal experiences of having already been and almost arriving. The grainy footage and fuzzy audio of the taped event produces a loop of synchronous feedback and forecast, equating the immediate past with the onrushing future and affording the spectator an ideologically impossible view of spatial and temporal simultaneity. Parallels can easily be drawn between Monteith’s work and Cassils’ sculptural showdown in Becoming an Image as each involves the self-documentation of the artists engaged in illegal or otherwise illicit acts, highlighting speed, fearlessness, rebellion, (female) strength and athleticism. What is more, in both cases, the production of the document is integral to the “performance,” which would be otherwise visually unavailable. The camera in both works effectively makes vision possible and causes a blurring of the boundaries between process and product. The double projection of Monteith’s work bears a connection with Mark Igloliorte’s small-scale diptych paintings of everyday objects, painted from different points of view or scale. Although produced in a medium that more explicitly bears the mark of the artist’s hand, the temporal tampering of Igloliorte’s pictures, forever changing perspective – like an ironed or unfolded cubist composition – echoes the alternating angles of the two motorcyclists. In all of these works, traces essentially become the markers of time’s passage. This is perhaps made most apparent in the video documentation of Francis Alÿs’ 2008 performance, Painting/Retoque Ex-US Panama Canal Zone. 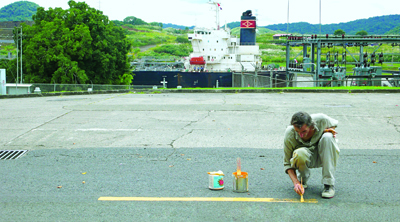 The video documents the artist peacefully (re)painting the yellow line running down the middle of a road in Panama, to the quiet bewilderment of the local population. Crouched on the concrete and immersed in meditative action, Alÿs forms a striking counterpoint to Monteith. Whereas she and her racing partner disregard and drive over the highway’s dividing lines, Alÿs calmly and quietly reinforces their presence. There is a critical undercurrent to this seemingly inconsequential act: Alÿs’ retouched line is echoed by the scene’s slowly moving backdrop in which barges obediently conform to the physical restrictions of the canal’s shipping lanes. It is a cogent reminder that there is a political dimension to the spatial divisions that define and delimit rights of passage. 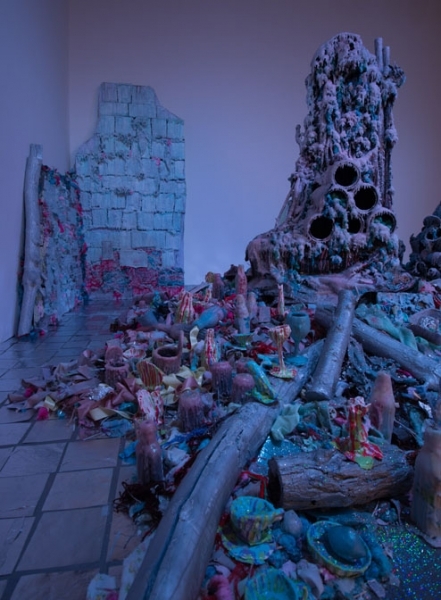 In a radically different example, Tricia Middleton’s multi-media installation, Crones, takes the accumulation of traces to their extreme: it is a mountainous mass of wool, wood, wax, glass and plastic; toys and household items; tree branches and grass; all coated in brightly coloured paint and covered with a heavy-handed dusting of glitter. The environment evokes a hybrid of something out of Narnia and the sugary seduction of the candy house in the cautionary tale of Hansel and Gretel. It looks like the destruction wrought by some hedonistic fairy’s birthday bash, unattended to, abandoned and left to decay. It is a fantasy, frozen in time; a manufactured ruin, repeatedly reactivated by the engagement of spectators. Over the past few weeks, we have made note of several major exhibitions throughout Montreal that have signaled a preoccupation with temporal traces and the making or erasing of material marks. We described a politics of eradication in the work of both Thomas Demand at DHC/ART and Lynne Cohen at the MAC, wherein the former’s fastidiously smooth surfaces drew comparison to the latter’s uncanny interiors. Each are emptied of people, but full of their traces. In fact, the traces of past presence extended beyond the mise-en-scène of the individual images in Cohen’s show as her photographs themselves bear a striking resemblance to the paintings of Pierre Dorion that had occupied the space immediately before her exhibition. Despite different media, Cohen’s photographs and Dorion’s paintings share a hyper-realist aesthetic in their approximation of unpeopled architecture. The clever and covert haunting of the present space by the prior exhibition has produced a kind of curatorial palimpsest that signifies the persistent effects of retained traces upon processes of exhibition and spectatorship. Preoccupied as we have been with the above-mentioned issues, it is no wonder that Material Traces piqued our interest. Tethering process to product in diverse media and materiality, the exhibition fosters and forges links that persist across time and space. Of course – speaking concretely for once – not everything can actually persist in time and space. Material Traces will be on view for one more week at the Leonard and Bina Ellen Gallery before closing on the 13th of April. This entry was posted in Uncategorized and tagged Amelia Jones; Material Traces; Contemporary Art; Francis Alÿs; Heather Cassils; Alex Monteith; Mark Igloliorte; Tricia Middleton; Installation Art; Video Art; Performance Art; Temporality; Materialit. Bookmark the permalink. Great sites, insights and incites by Natareilley in this piece. And in the end I can see that supreme artist Lily Tomlin snuffling into her handkerchief and hear her saying, “speaking concretely for once, not everything can ACTUALLY persist in time and space,” and giving us the remaining schedule of the exhibition in her most helpful telephone operator’s voice. That’s interesting stuff here.I enjoyed reading the post.